Interesting look at past fads in the past decades, but decidedly in a more British context than desired. Thundercats, Benny Hill, Mullet, Atari etc all evoked a strong sense of nostalgia in me. However there are a few key points which made it hard to recommend this book. 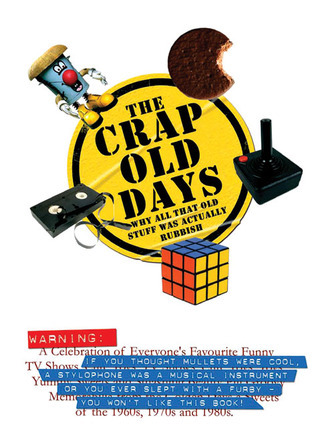 Firstly, the strong British humour utilised in this book may be lost on some but not to fans of 'Allo allo and Monty Python, but can be offensive due to the strong bias of the author against some items (New Romantic bands etc) and the vulgarities used, both of which may disappoint the relevant fans. Secondly, the text accompanying each of the items featured were too short, and mostly contained the gripes of the author. It might be better to incorporate some element of how fans can grab a piece of history again in the current age, such as fansites or availability of DVDs for old cartoon series etc. At the end of the day, it seems pretty empty to read as the pictures are sparse and few in between. Many of the items featured have to be imagined by the reader or Googled for even a basic understanding. WayneWilliams Darren Allan - Wayne Williams has been writing, editing and publishing magazines for over 23 years. Until September 2005 he was the co-owner and Editorial Director of Live Publishing, an independent magazine publisher based in South Manchester.He is now a full-time freelance writer, focusing on his twin passions of technology and travel.I Know What You Did Last Supper, co-written with Darren Allan, is his first novel.